China Restores Public Access To Microsoft's Bing Search Engine After being pulled offline for hours, Microsoft says its search engine is up again in China. Microsoft says it's not the first time its service and those of other companies have been blocked in China. 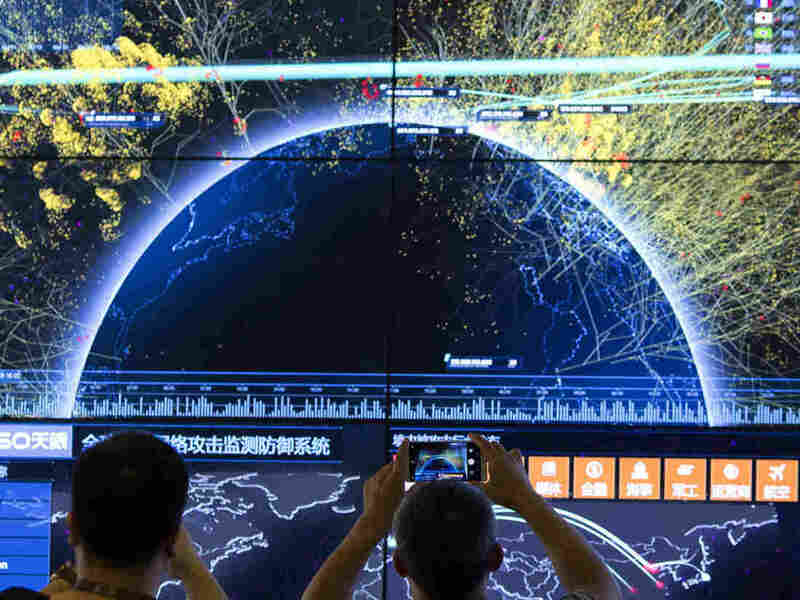 This is a visualization of global Internet attacks, seen during the 4th China Internet Security Conference in Beijing. Microsoft's Bing search engine is no longer accessible in China, the company reports. "We can confirm that Bing was inaccessible in China, but service is now restored," the spokeswoman said in an emailed statement. The company declined to provide details about the cause of the disruption and return of the search engine. It is unclear how long site was down, however, Bing was one of the last well-known foreign search engines operating in the country. Users who tried to search the site were directed to a page reading, "This server cannot be reached." Microsoft President and Chief Legal Counsel Brad Smith explained that it's not the first time the search engine has been blocked. "It happens periodically," he said in an interview with Fox Business News from Davos, Switzerland, on Thursday. "You know, we operate in China pursuant to some global principles that's called the Global Network Initiative in terms of how we manage censorship demands and the like," he said. Although Bing enjoyed only about 2 percent of China's search engine market, its banishment was significant in a country known for controlling electronic access to information. With Bing blocked, China's citizens had even fewer options for finding information on the Internet. Smith discussed previous instances of "difficult negotiations" with the Chinese government in which certain "issues do lead to our service or some other services being blocked." "It is an area where we understand we don't have the same legal freedom that we do in other countries, but at the same time, we stick to our guns," he added, noting that the company was still waiting to find out what triggered the cutoff. NPR's Shanghai Correspondent Rob Schmitz confirmed the search engine was unavailable: "Chinese Internet users first started noticing problems on Wednesday with the site, when it was inaccessible inside China's so-called Great Firewall. China's Internet regulator has yet to comment on the issue." Bing had been allowed to operate in the country because it censored search results, Schmitz reports. Microsoft is also part of the Internet Society of China, "a government-linked body whose members refrain from establishing links to websites that contain information deemed harmful by China's Communist Party," Schmitz says. The Financial Times cites "two sources familiar with the government's order," who confirmed that China had blocked the search engine. Chinese tech company, Baidu, which controls about 70 percent of the market, complies with government censorship policies. Major global Internet companies have long been blocked in China. Facebook, which has been blocked in China for the past decade, momentarily had plans to open a subsidiary in China last year, before approval was withdrawn. In addition to blocking Twitter, Chinese authorities have been known to delete the posts of users who manage to get around the ban, by hacking into their accounts. Google exited the Chinese market in 2010 but was reported to be developing a censored search engine that could get it back into the country. "Blocking virtually your entire population from being able to search the non-China web can only hold them back," The Economist's Simon Rabinovitch tweeted. "Harm might not be immediately obvious but it will be there over time."